Yesterday, the top brass of the Chicago Cubs – President Theo Epstein, General Manager Jed Hoyer, and Manager Joe Maddon – led a season-opening press conference, which you can watch in full at the end of this post. Although there was a lot of interesting baseball fodder sprinkled throughout the 47-minute discussion – some of which Brett has already gotten into here and here – there an even more important, lengthy discussion about Addison Russell, domestic violence, and the Cubs’ plans to address these issues this spring and into the future. We thought the discussion was worth sharing in its entirety. 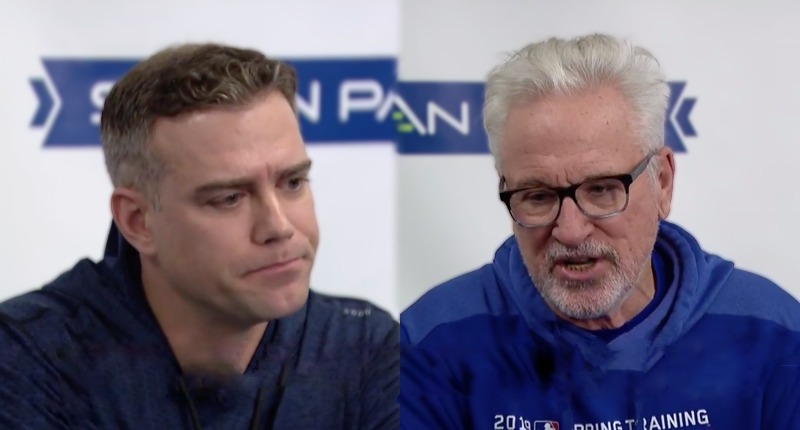 So below, you’ll find full quotes from Theo Epstein and Joe Maddon, without our commentary at this time, including the questions that prompted them. Question: Addison Russell, obviously here a little bit early, has he maintained the work you’ve laid in front of him and have you had any talks with him about how he’s feeling just with this opportunity to be back with the team? Theo Epstein: Yeah, I’ve stayed in good contact with Addison. I think I said it at the convention, we’re at like the top of the second inning with this process and as we get here this week and start Spring Training, we’re probably still like in the bottom of the second inning. We still have a long way to go. Addison is well-aware he’s been given a conditional second chance by this organization that there are a lot of standards we’re going to hold him to. He has to continue to put the work in to become a better person, a better citizen, a better teammate, a better member of society, a better father. And the good news to report at this early juncture is that he’s really taken things to heart and has put a significant amount of work in. He’s fully and enthusiastically complied with everything Major League Baseball has put in front of him, as far as therapy and counseling going forward. Beyond that, he’s reached out on his own to engage with a therapist, someone he’s still in contact with 3-4 times a week and that relationship will continue long after the mandated therapy is done. He’s gonna speak to you guys before the start of position player camp. I think that’s an important step. And I believe you’ll see someone who takes full accountability for what’s happened and will be happy to share with you the work that he’s putting in. So from our end, you know, he’s a full participant in Spring Training, per the Major League Baseball policy. As long as Addison continues to put that work in and continues to meet the standards we’ve laid out for him, then we’ll support him on this path. And I should say, it’s at least as important if not more important that we’re also continuing to support Melisa, who is the victim in this whole affair and continue to stay in touch with her and support her and give her the resources that she needs, as well. So, beyond that, as an organization, we’ve taken this plague of domestic violence to heart. We’ve talked – she wants to play a small part in attacking this problem. And from an organizational standpoint, we’ve really stepped up and enhanced our training. By the time Spring Training is over, every single employee in this organization will have gone through enhanced domestic violence training. 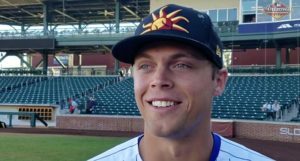 So every major league player, every major league coach, every major league staff member, every minor league player, every minor league staff member, every member of the front office will have gone through a pretty rigorous domestic violence training program to increase education and awareness. That process has already started with the folks back in Chicago – I think we’ve already had over 130 or so employees who’ve gone through the training. And it’ll continue here in Mesa, in Spring Training. We’ve added an elective healthy relationship training program for the players families that’ll be part of the initiation for players wives and I think that’s important. We’re also making sure those that face the players families outwardly such as the head of our family program go through even more training – a 40 hour training program, which is sorta the standard to become as expert as you can in domestic violence detection, awareness, prevention, education. And we’re gonna make sure that also someone who travels with the team is goes through that same 40-hour training program. Experts say you can never say domestic violence will never happen again, here. But you can still take every step necessary to ensure that this is the safest possible work place and so that we have the smallest possible chance of any domestic violence occurring within these walls. And then outside of these walls, we’ve engaged with a number of groups that do tremendous work trying to prevent and eliminate domestic violence. Family Rescue is organization based in Chicago – Joyce Coffee is the executive director. They’ve just done incredible work over the years trying to eliminate domestic violence. They were actually engaged with the Cubs two decades ago in doing some domestic violence training and that’s something that we’re bringing back. We’re working with them on this training, on the education, we’re providing financial support for them, Joyce and her team, to do tremendous work. And just blocks from Wrigley Field, the House of Good Shepherd, which is a residential domestic violence recovery facility. We’ve had a 20-year relationship with them and we’re enhancing that relationship, getting even more involved with them, and that includes a capital commitment to build a safe space for kids who are living on their campus. Again, I think we took our pledge to become a small part of the solution very seriously, knowing that this happened on our watch. And that we’re not just trying to support Addison, we’re trying to support Addison (if he continues to put the work in), to support Melisa, to improve this organization, make it the safest possible place, and then also to do our part in trying to attack the problem that faces all of us in society more broadly. Thanks for the question. Question: Theo, would it have been the easy way out for you guys to just cut ties with Addison and move on? I don’t know, I don’t want to characterize anything about domestic violence as easy. I will say I understand people who are critical of the approach we’ve decided to take. I have a number of people who I trust and share things with and bounce things off people who have moral compasses that I think are as good as they come and who are people I really trust and respect and I’d say about half of those people really embrace the position that we’ve taken. They think that digging in and trying to make a difference is the right way to go. And then the other half think that we should have, as you said, just cut bait and moved on, because we do know that we send a message to our fans with every action that we take. And that cutting bait sends a simpler, stronger message. But that digging in and trying to make a difference on all these difference fronts sometimes that’s a little more nuanced and that can get lost in translation. I personally think we’re doing the right thing. I understand people who are upset and think we should’ve just moved on. But I can at least pledge to those people that we’re taking this on earnestly, that’s it’s important to us, that they’re not just words, they’re actions and that I will continue to be transparent with you and with our fans about everything that we’re doing to try to attack this problem of domestic violence AND that we will continue to hold Addison to an incredibly high standard or he won’t play a regular season game as a Chicago Cub ever again. Question: Joe, What’s your role in this on a team level, in terms of Addison addressing this with his teammates? 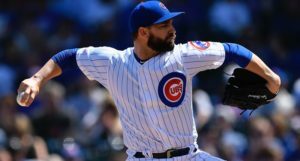 Joe Maddon: I was in contact with Addison a little bit during the offseason and I cannot say things better than Theo just relayed all that information to you. Of course, I’ll get in front of the team, of course, Addison shall also. And we’re just going to continue to try to move it forward. Again, a lot of “ifs” are attached to this healing process and we’re going to try to work through all the ifs. But again, Addison appears to be doing all the right things. Obviously, as an organization, we can’t be more complete I don’t think in what we’re trying to get done right now, so my role is just to be out front, my role is to try to make this work as best as we possibly can and come out on the right side eventually. But to this point, I’ve been in touch with Addison, he’s trying very hard to make all this right. Question: You know that clubhouse really well, any concern that this will be a distraction or divisive in any way? Joe Maddon: It’s always the potential there, I can’t deny that. And that’s why it’s really important that I think we’re very transparent regarding how we’re dealing with this and all the particular policies or items we’ve been putting in place in order to try to prevent this from happening again. I think if the players see that we’re really organized in our attempt to put this back on the right track and get Addison back on his feet, make him a really productive part of society once again, I think that our players could get on board with something like that. So this stuff is being made obviously apparent to all of you guys, our players understand all of this, too. So, it’s one of those one-step at a time things. And we’re not healed yet, like Theo said about bottom of the second inning, maybe going to the top of third, and you just have to be, I think, authentic and transparent about the whole situation. Theo Epstein: One thing, I think … you’ll notice with the domestic violence issue, we didn’t come out right away talking about everything we we’re going to do, because I think words are cheap and actions mean a heck of a lot more. So I don’t want to sit up here as some sort of a PR operation and say, like, “No, here’s what we’re doing in response,” because I think that lessens the impact and lessens the meaning overall. After we’ve put some of these programs in place with respect to domestic violence, then, if asked, we’re a little bit more comfortable talking about it. But we’re still early in the process. I’d still rather let our actions take hold and speak for us, rather than come out and use talking points to try to get around issues – that’s not possible, that’s not the right approach. Cubs president Theo Epstein, general manager Jed Hoyer, and manager Joe Maddon speak to reporters as pitchers and catchers report for the start of spring training.